Cook the pasta according to directions on the box (about 10 minutes). Rinse and put in cold water. Saute the ground turkey until cooked (about 5-10 minutes) and season with salt and pepper. Thaw the spinach and preheat the oven to 350F. Pour a layer of marina into the bottom of a baking dish. Mix ricotta, mozzarella, parmesan, and egg until well combined. Add salt and pepper, basil and parsley and mix well. Add ground turkey and spinach to mixture, mix well. Fill each shell with a few tablespoons of filling and place in baking dish. 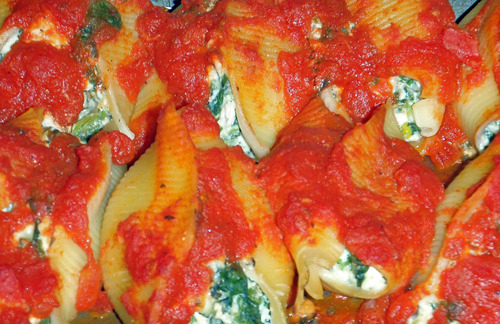 Cover your shells with a layer of marinara and cover the baking dish with foil. Bake at 350F until bubbling at the edges (about 35-40 minutes). Let cool for 10 minutes before serving. YUM! Great work on this, love the recipe! I was just thinking about making these soon, thanks for the recipe!! I love your blog…your recipes look amazing…I wish you would set up following with email updates…please!!! 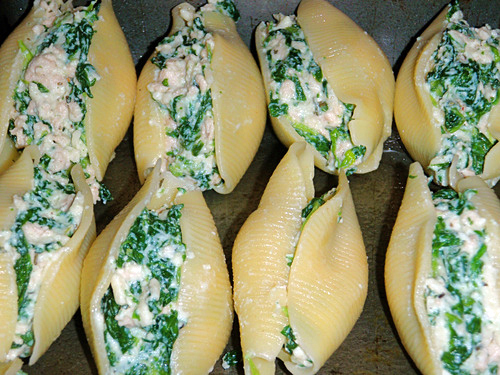 The one time I stuffed jumbo shells like these, they just didn’t hold up well. Maybe I didn’t put enough cheese in the stuffing or cooked the shells too long. I will have to try your recipe for better success. Thanks! My food group must be craving some serious pasta today. Ive seen several recipes posted today for wonderfully delicious stuffed shells and I am working on a pasta dish myself for supper. I never thought about stuffing shells with ground turkey, but I love it! Just added this recipe to the “to try” list, thanks for sharing! 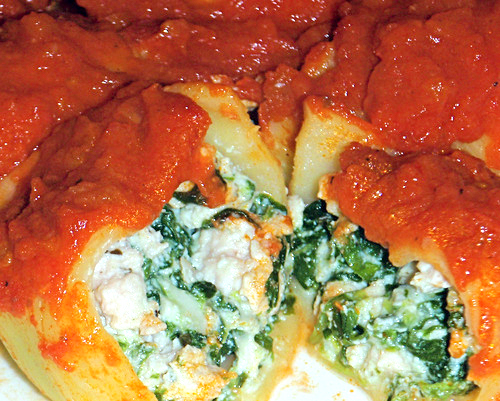 I love stuffed shells…your variation is beautiful!